Our oldest son is biological. When I was 17, I found out it may be difficult for me to have kids. We were blessed JC came so easily, with no infertility treatments (which we were actually in the process of preparing for). We hoped for the same a couple years later but it proved not to be. We ended up doing a variety of infertility treatments, 5 total, which were all unsuccessful. We brought home our next two children through adoption and kind of felt like we were done. The past several weeks have been incredibly humbling as I’ve once again been reminded that God has a plan for our family. I want to take just a minute and say a few words to anyone reading who may be struggling with infertility. First, I see you. I know how it feels to hear news like this and be so happy for the lucky couple but also want to go cry in the corner. Second, do not write the ending to your story, it’s not over. There were so many times in the past 12 years where I really thought there was nothing else for us. I would have never thought, a few years ago, that I would be sitting here, writing this, while expecting our fourth child. Who is in my uterus. Never. It’s not lost on me how incredibly blessed we are and I promise you I won’t ever take that for granted. 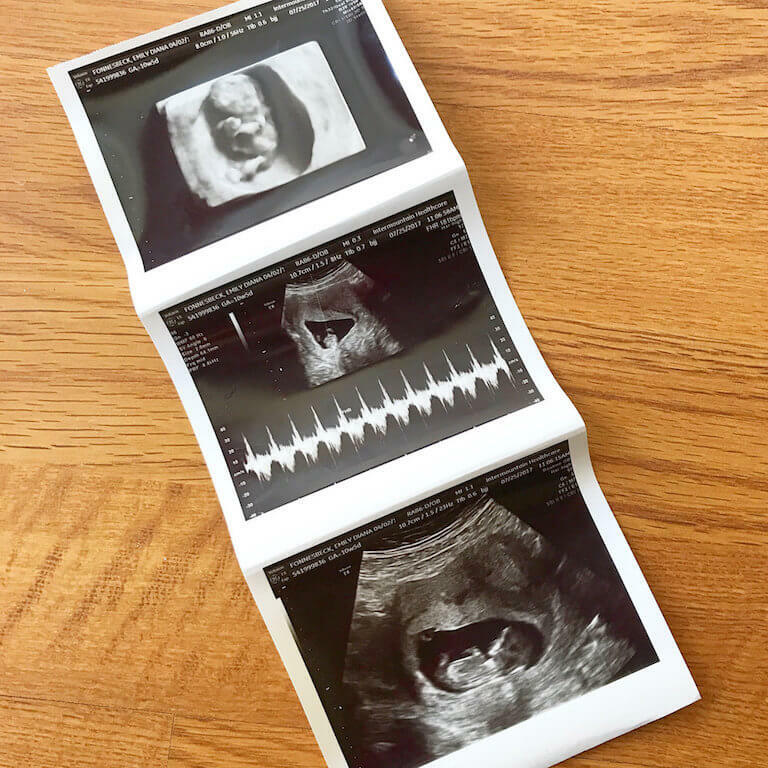 One of the first things I thought about when I found out I was pregnant was all of you who are just aching for one child and one pregnancy and here I am with my second pregnancy and fourth child. It’s incredibly humbling. The best advice we ever got was at an adoption orientation about 9 years ago. We had felt inspired to pursue adoption, but I was still really struggling with the idea that I may never be pregnant again. The caseworker leading the group said “For a lot of people, getting pregnant and having children is their normal. For you, that may not be your normal. If it isn’t your normal, you can make a new normal. Adoption can be that new normal.” It hit me like a ton of bricks and I chose to embrace our new normal. I am so glad I did; adoption was the gift that infertility gave me. I couldn’t, and wouldn’t want to, imagine life without my two adopted children who were totally meant to come to our family. That isn’t to say adoption was easy, we worked really hard to bring those 2 kids home. I’m also not saying that adoption is or should be your normal, but I know the peace that comes with accepting who I am and what’s meant for me, as well as who I’m not and what’s not meant for me. It’s a process and you can feel whatever you need to feel about it. Eating a wide variety of foods in a flexible way while honoring and respecting my body’s signals of hunger, fullness and satisfaction. No exclusion of any food or food group. This helped me physically but also decreased the psychological stress of navigating food from day to day (especially while traveling, eating out, at social events, etc). About 3-4 years ago I started Operation Calm Down which I desperately needed. Historically I would have described myself as a Type A Perfectionist and even been proud to call myself that…until I understood how miserable it made me. Since then I have been actively working on stress reduction, setting boundaries, saying no, resisting the urge to please others at my own expense, letting go of the need to control while taking lots and lots and lots of deep breaths (and therapy sessions). I have learned to be kinder to myself, to cut myself some slack and not set expectations so high that all I feel is ashamed of never being good enough. Basically, I’ve calmed down which has absolutely made a world of difference. Let’s take a minute on that last one – has that been easy? In general, no. But I have worked SUPER hard to prioritize function over appearance, focusing on how I feel not on how I look. Without a doubt, my physical and mental function is much better when I am eating adequately and maintaining a weight that is higher than I what used to view as “healthy”. As such, I’ve separated my worth and value from my appearance and redirected it into who I am. When I stay true to myself, which includes respecting MY body and it’s natural healthy weight, I feel my best. This pregnancy really sealed the deal for me. Any part of me still wondering if I was actually at my ideal body weight was put at ease with this news. It just totally reaffirmed that I am exactly where I am supposed to be, doing exactly what I am supposed to do. I realize that no story is the same, but I do think there are at least a few answers for everyone in subjects such as adequate nutrition, a healthy and moderate approach to exercise, maintaining a weight within your genetically predetermined set-point, stress reduction and acceptance. This is getting lengthy but I wanted to wrap up with some initial thoughts on Intuitive Eating during pregnancy. It’s been a life saver, really. I’ve had so much practice over the past few years in listening to what my body needs and taking care of it in a way that will allow it to function at it’s best. All the tools I’ve gathered have been consistently applicable during pregnancy. I think the lesson here is that no matter what life throws at you, Intuitive Eating gives you the tools to adapt. This ability to be flexible certainly beats the more commonly used all-or-nothing mentality. More thoughts to come!